For much of its history, a connection was assumed between Chardonnay and Pinot noir or Pinot blanc. In addition to being found in the same region of France for centuries, ampelographers noted that the leaves of each plant have near-identical shape and structure. 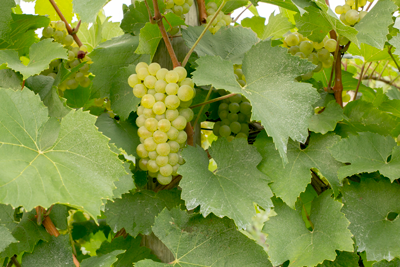 Chardonnay has a wide-ranging reputation for relative ease of cultivation and ability to adapt to different conditions. It has a vigorous vine, with extensive leaf cover which can inhibit the energy and nutrient uptake of its grape clusters. This can be managed this with aggressive pruning and canopy management and do well with an umbrella training style. In certain conditions the vines can be very high-yielding, however wine quality will suffer if yields go much beyond 4.5 tons per acre. The most prestigious French white cultivar. Exceptional if made into a sparkling wine (Blanc des Blancs). An appealing fruity fragrance resembling pear, fig, apple, or melon. One of the best varieties to produce fine table wines, can become quite complex when aged on oak. Classic “buttery” notes can be produced with the use of a secondary malo-lactic fermentation.